Netflix still believes in superheroes. Although the megastreamer has recently canceled a wide swath of its Marvel offerings, it’s keeping the metahuman dream alive in the form of its latest original offering, The Umbrella Academy. Based on a critically acclaimed comics series written by My Chemical Romance front man Gerard Way and artist Gabriel Bá, the show follows the exploits of a supremely screwed-up family of superpowered adoptees who were brought together by an eccentric aristocrat to be a squad of crime-fighting children, then grew up into varyingly miserable adults. When their patriarch dies, they reunite and fall into a well of intrigue and violence. 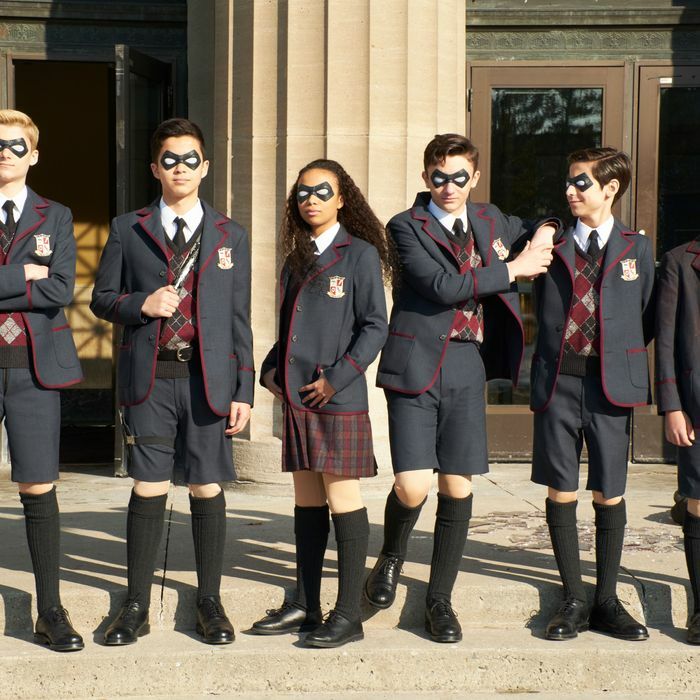 Ahead of Umbrella Academy’s premiere today, we caught up with Way and showrunner Steve Blackman to talk about Mary J. Blige doing her own stunts, the joys of cult band They Might Be Giants, and what Way has coming up next. Gerard, you recorded a cover of “Hazy Shade of Winter” for the show. Have you gotten any feedback from Simon and/or Garfunkel? Gerard Way: [Laughs.] No, no. No feedback from them yet at all on the song. How did you pick that song? Gerard, let’s jump in the time machine. What was the first idea that led to the comics version of The Umbrella Academy? Way: I was reading Mike Mignola’s Hellboy. I thought to myself, This is a horror comic, but it’s not a horror comic at all. And I thought there was nothing like that for superheroes. I started drawing these characters backstage. Way: Yeah, ‘cause you have so much time to kill on the road. Let’s say you’re playing at 8 o’clock at night. You’re just sitting there all day, so I just started drawing them. I wrote down a list of interests that I had — everything from seances, tarot cards, fortune tellers. Just all this stuff. Way: And then I tried to make characters based off those interests. Steve, how did you first encounter the comic? Blackman: I’d finished another Netflix show called Altered Carbon. I came from Fargo before that, so I was looking for something character-based. And I heard about this project. I hadn’t met Gerard yet, and I started reading the comics. I’m not a graphic-novel fan, but the graphic novel spoke to me. At the end of volume one, I knew every character and I knew who they were. And I read it instantly as a dysfunctional family. And then I talked to this guy [points at Way], and the rest is history. Way: They weren’t a family when I first created them. Way: They were just this collection of weirdos. And I remember the moment where I was like, Oh, I’m gonna make them related. It changed everything. Steve, was there anything from the comic that you really wanted to keep and you just couldn’t make it work? Blackman: There were two things. The show’s supposed to be highly stylized, so I wanted to try to do the kids in the Eiffel Tower. [Editor’s note: In the comic, there’s an opening flashback in which the Umbrella Academy kids fight evil in Paris, where it’s revealed that the Eiffel Tower is a rocket ship.] But then I went to the producer and he said, “Uh, yeah, that’s Michael Mann’s budget.” Like, that’s how much it would take to really do that right. And then I loved the transformation of Vanya. We wanted to take that further. It couldn’t be that, in one episode, she turned. We wanted it to be a much longer game. So we thought of a psychological manipulation as a physical manipulation. I think that worked out well. Gerard, what has your and Gabriel’s involvement with the show been? Way: I worked with [writer and producer] Jeremy Slater in the beginning, and I’d kind of back him up in interviews. There was a contract thing, and he wasn’t the showrunner anymore, and Steve came on. And then Steve brought me in to meet the writers room. They just sat and asked me questions for a day. And then I created this 18-page document that spelled everything out for The Umbrella Academy from graphic novel one to eight. So, they all have that. They have the plot outlines for stuff that hasn’t even been published yet? Precious cargo. Way: Yeah. We were on set for the first week of shooting, Gabriel and I. We got to weigh in on stuff, and it was ultimately Steve’s call whether he wanted to go with the notes or not. But I feel like he was always trying to be respectful of the source. Gerard, what was your favorite thing that the show added? Did anything make you think, Oh, man, that’s a great idea? Way: My favorite is how Spaceboy [Editor’s note: That’s the code name for Luther in the comics] is handled. In really early drawings, he was wearing a coat to hide his body, and I was like, “This is a bit Ben Grimm; it’s a bit Fantastic Four.” Gabriel just took it and ran with the character, so we ended up not going with a coat. In the comic, he’s this huge, kind of gorilla body. But it was a bit too much, Steve felt, for viewers, so he made his body and how he gets that body a bit different than the comic. It really works. And the fact that the character is clothed, it makes a lot of sense. Blackman: We agonize over these things because I want Gerard to be happy. I want him to respect it because this is the thing he and Gabriel birthed years ago. Gerard, I interviewed you a few years ago, and I was surprised when you said comics were your main thing at the time, what with Umbrella Academy and your work with DC. Has that changed in the past couple of years? Way: It hasn’t changed. Comics really ended up being a big part of my life. I just wanted a break from music, in some ways. After the solo tour went really well, I was like, Well, what do I do now? I felt like being a writer for a couple of years and working on that craft. ‘Cause it’s super challenging, writing. And I wanted to be around my family. I work from home. I have a studio separate from the house, and I just go to work every day and then come in when I’m done. I’m sure you can’t get into much detail, but what do you have coming up on the horizon? Way: We’re bringing [DC Comics series] Doom Patrol back in the spring. Still writing that. I’m trying to think of what I can talk about … there’s not a whole lot, but there are one or two other books I’m working on. At some point, we’re going to discuss really making an album or music or something like that. Have you ever thought about writing a rock opera? Way: Well, [My Chemical Romance album] The Black Parade was a little bit like that. But I don’t go in much for Broadway or theater. Blackman: If you’re looking for badass tambourine, I’m your guy. I’m ready. Tell me about casting Mary J. Blige and Cameron Britton as time-traveling assassins. It’s the odd-couple surprise of the season. Blackman: The oddest couple of the season. They’re great. I knew I wanted Cameron Britton from Mindhunter. I wanted to play in a height difference — I wanted a big Hazel and smaller Cha-Cha — and I wanted someone you knew had this real counterpoint to Hazel’s sweet giant-ness. Names were thrown out, we came to Mary J., and I said, “Can we get Mary J?” They go, “Yeah, she wants to be an assassin. She wants to throw punches and kick and shoot.” So I got on the phone with Mary and she’s like, “If you let me punch and shoot and do my stunts, I’m in.” And she did a lot of her own stunts. Blackman: Yes! We have a double when it’s really dangerous, but she did a lot of that. And then her and Cameron became really good friends offscreen. So when they’re together, you buy that they’ve been doing this for years, killing people. Where did you find Aidan Gallagher, the kid who plays Number Five? Blackman: We’d gone everywhere. We had gone to the U.K., Australia, Canada, America. I’d seen over 320 kids. And this tape pops on and the kid looks at the camera and goes, “I will kill for this role.” That was Aidan. And he was great. He embodied the character. This 58-year-old man in a child’s body. He brought a darkness to it. Blackman: And the sullenness of it. He came and nailed it every day. The biggest moment of panic was when we were running out of casting time. I thought we were never gonna find this kid. Aidan Gallagher popped up and I’m like, “That’s him.” I knew instantly. People have compared the trailer to a Wes Anderson movie. Were you thinking about his work when you were creating the show’s look? Blackman: [To Way] You want to take that? Way: It was a definite inspiration of the comic when I started it, especially the opening sequence. I just love Wes Anderson’s films, and I was really inspired by it. There were no comics like that. And it was a little bit in line with the Hellboy thing, where I was like, “Well, let’s just take, like, a little bit of this flavor and apply that superheroes.” I think it still has those little bits of flavor, but I feel like we dialed that stuff back. And Steve helped it find its own identity. Blackman: There are little moments of Wes Anderson here and there. Tell me about your philosophy for music cues. I was especially fond of the shootout set to They Might Be Giants’ cover of “Istanbul (Not Constantinople).” What were the origins of that cue? Blackman: You have this little boy who is actually a 58-year-old man taking on all these guys. For the people who didn’t know the comic, I wanted them to not just sort of cue into the vibes, but feel a disconnection from them. Like, “What’s going on here? I’m hearing ‘Istanbul’ and then these people are being taken out?” I felt there was a wonderful counterpoint to that song as opposed to playing a violent, bass-driven song. Gerard, what’s your favorite music cue in the show? Way: One of my favorites is how effective “Dancing in the Moonlight” was. That scene feels like a small nod to a scene in Dallas [the second volume of the comic], where Spaceboy has this dream where he has this life with Allison. This dance that they have together, it was a moment that reminded me of the book, but took it a step further. I thought it was a really effective use of music, even though I’ve heard that song a bunch. It still worked really well. Way: Oh, yeah, that’s a great song. That’s episode one, right? It really sets the tone for what you’re watching. Blackman: Yeah, and I put that in because I felt like we’ve all had that moment. When you have brothers and sisters, you fight, but when you’re in your own room, you forget everything out there. They think they’re so far apart with each other, emotionally, but truly, they’re all the same. They’re all doing the exact same thing in their rooms. And then when we do that pull-out shot — what I call the “bread scene” — you really get to see that they all are part of this family. In both the comic and the show, how did you want to talk about trauma? Way: I wanted to be able to show these characters work on their trauma and try to get past it. I also wanted to raise the question of, “What is acceptable in order to achieve the greater good? How far would you push your kids if you knew they had to save the world?” Almost all of [Sir Reginald] Hargreeves’s behavior is unacceptable. Completely unacceptable. But, you know, it’s an interesting question to raise. Way: Exactly. It will raise questions like that and be like, ‘This is kind of fucked up, isn’t it?’ Umbrella Academy, in a lot of ways, is a comic about comics. And I do think that translated in the show. Steve, how did you want to talk about trauma? Blackman: Freud said we get trapped in different levels of development when we fail to evolve past a stage, and these kids are all trapped in a certain stage of development. Their father treated them more like lab animals than kids. All of them went off into the world, but none of them properly moved on. They have to come to the conclusion, “Our dad might have been good or might have been bad, but we have to get over him to get on with our lives.” And they don’t really get to do that, ‘cause he’s died. When you lose someone before you get to say good-bye or reconcile, that leaves behind all this baggage. What was the process of digitally creating Pogo, the refined anthropomorphic chimpanzee? Blackman: I can tell you all about that. It was a very tough thing we did. Early on, I made the decision that I didn’t want to have the physical person on set. So I said to myself, Who can do great monkeys, chimpanzees, and apes? And I remembered Planet of the Apes. Weta [Workshop] does that. So I called them and I said, “Do you want to do one great chimpanzee for us?” They said, “Well, we don’t really do TV.” I said, “Come on, do it with Netflix.” So they agreed. Adam Godley is the voice, but Pogo’s completely CG. There’s no one on set. There are no little white balls? Blackman: There are no little white balls at all. There’s just a man who stands there, a sweet actor who allows the actors to emote and do the scene. He’s completely removed. Was it hard to put together the global destruction that breaks out in the finale? Blackman: Oh my God, yes. Way: They were working right up to the last minute. Blackman: I mean, just a few weeks ago we finished. It was a monster, that last bit. We put 458 VFX shots in just that episode.